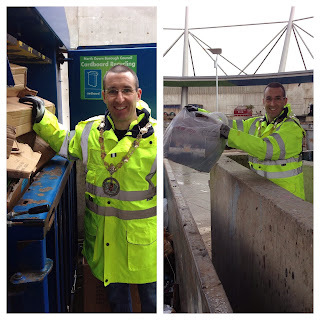 I rolled up my sleeves as Mayor on 19 February and spent a morning working at the Council’s Recycling Centre at Balloo. I was able to witness and support the efforts of both Council staff and the public to recycle and reuse as much of their unwanted items as possible on the site during my visit. I personally experienced some of the physical challenges faced everyday by the on-site team as they seek to help members of the public to recycle in the right way. I was very impressed at the efforts of the all the staff and the significant contribution they make to the Borough, often in the most inclement conditions. North Down Borough Council employs nine people at its Balloo Recycling Centre and in the year 2012/2013 there were nearly 15,000 tonnes of household waste processed through this site alone. From this, 10,630 tonnes of recyclable material were collected and 145 tonnes of items reused through the reuse container. This equates to a recycling and reuse rate of 73%. There are over 21 waste streams that can be recycled on site. As well as facilities for reuse of furniture, mattresses, bikes and paint. Alison Curtis, Waste Services Manager at North Down Borough Council facilitated the Mayor’s visit. She said: “We are delighted that the Mayor has taken time out of his busy schedule to meet with the staff and assist them on a typical day at work. He has been able to see for himself the challenges they face on a day to day basis. It is not an easy job but the staff are a credit to the Council. They work well as a team and there is a great relationship between staff and the majority of the public who use this facility and appreciative the services provided. The staff take great pride in their work and the contribution they make to the Council’s Recycling Rates. The Mayor’s visit to Balloo Recycling Centre will hopefully encourage more members of the public to come and have a look for themselves.